Thinking positive about getting out of here! I know that the gripping tale of RV modifications in Part I had you sleepless for nights on end until I provided the rest of the story! 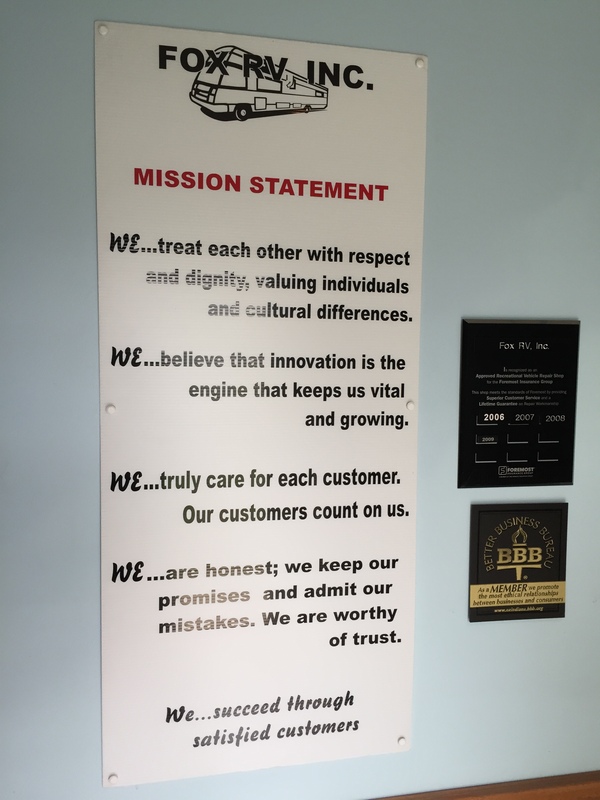 So before you lose any more sleep, here is the final shop talk of our RV modifications! Quadra didn’t have an appointment available for a couple of weeks, so we camped at MorRyde a bit longer, then move to the driveway of some VERY gracious friends. We met our friend Tom a year ago at the Hersey RV Show. Jeff had is bike in our hotel room and just across the hall Tom had his bike in his room. They both noticed each others bikes. Jeff and Tom got to talking and found out that they were both Ironman Triathletes, and an instant bond was formed. We’ve kept touch in with Tom (who also works in the RV industry) and have made a point to go to dinner whenever we were in Elkhart. Since we have been in Elkhart for so long Jeff started riding with Tom and his cycling group each morning at 4:50AM. We got to spend a lot of time with Tom, his wife Tera and their 3 girls. It was so fun being a part of their family while driveway surfing. I’m not going to lie…I’m going to miss those girls. I just might have shed a little tear when we left. We vacated our delightful accommodations in Elkhart and headed over to Quadra in White Pigeon, MI and camped in their parking lot while they installed our leveling system over two days. We thought that Big Foot was just an exaggerated name for their system, but after seeing the plate sized pads of the levels, BIG Foot is no joke. White Pigeon is a two stop light town that is home to an amazing RV surplus store called Bontragers. They have axles, thousands of RV windows, RV electric and plumbing parts, lights, windshield wiper blades, appliances, furniture and even the tiniest screw, plug and spring. They even had stuff you didn’t know you needed until you saw it! It’s a very organized flea market feel with great prices. We found a replacement porch light (the only one it’s kind) for the Domani for $35. We were having a hard time finding it online…and there it was! My biggest find was the coveted MCD dual roller shades that every RV’er dreams of owning. We had a quote from MasterTech for $1,800 for ten windows, so pricy that we opted not to get them. I was able to find 9 MCD’s shades out of my 10 windows for $270…TOTAL. The kick is good, SCORE! road debre from damage. When Quadra opened up the covering water was dripping out…which meant that it has been compromised. Quadra recommended driving to Middlebury, IN to have a new covering installed by Fox RV. Of course Fox RV couldn’t get us in until the following week. AND, since we are going to be there we will have them replace our 3 step fold up entry stairs with a 4 step. Why a 4 step? When we raised the RV with new axles it caused our 3 steps to be raised too high. Plus, the last step was unstable from previous use. The 4 step entry was another bargain find at another RV salvage yard for $65 (reg $299). Ok. So this was not an RV upgrade, but it was one of the most memorable stops of our trip. This is an Amish bakery with the most amazing pastries we have EVER tasted. 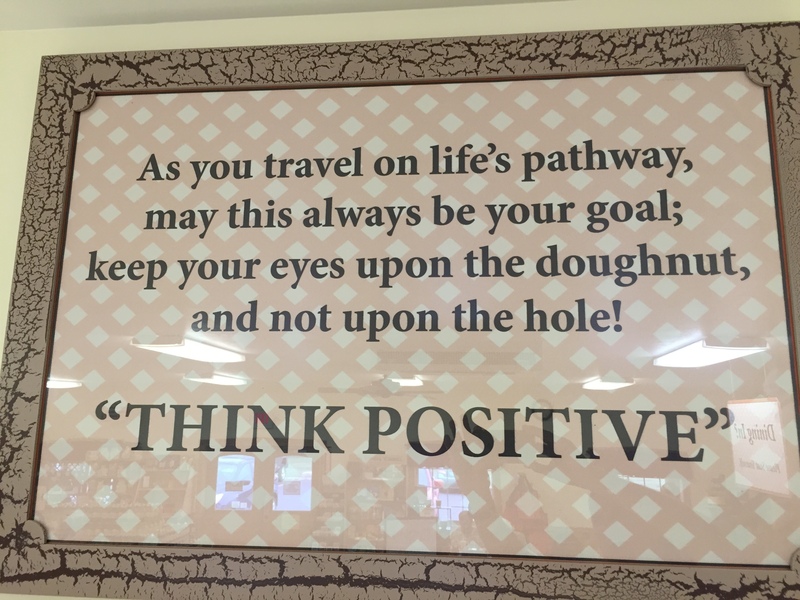 After having their famous cinnamon donuts we were speechless. Literally speechless! Pure melt-in-your-mouth gooey dough with just the right amount of sweetness. 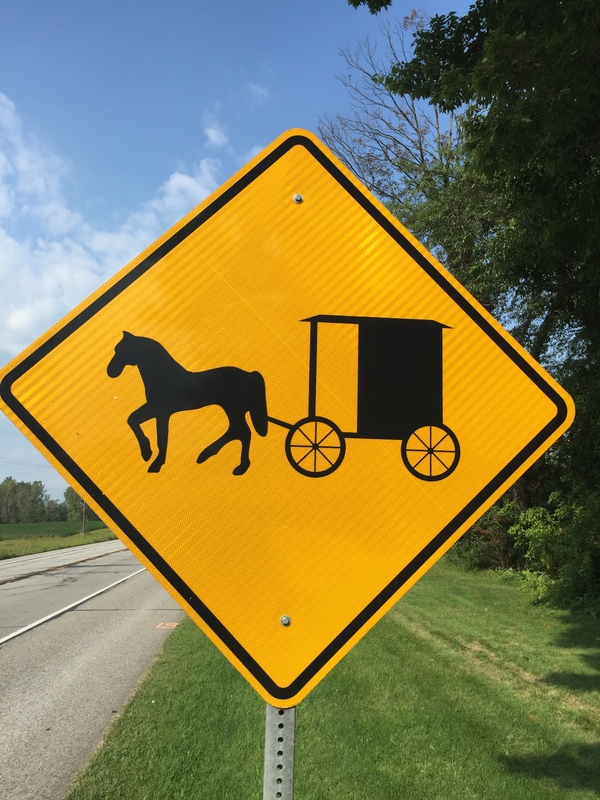 No wonder the locals call it “Amish Crack”! Instant addiction and I want it bad! If you ever come to this area you have to make every effort possible to stop a Rise N Roll. Really. YOU. HAVE. TO. Rise N Roll Bakery. I LOVE YOU! Powdery perfection…I want you in my belly! One thing has led to another on our RV project and we have this last appointment to make this week before heading back to St. Louis, then on to Arkansas. 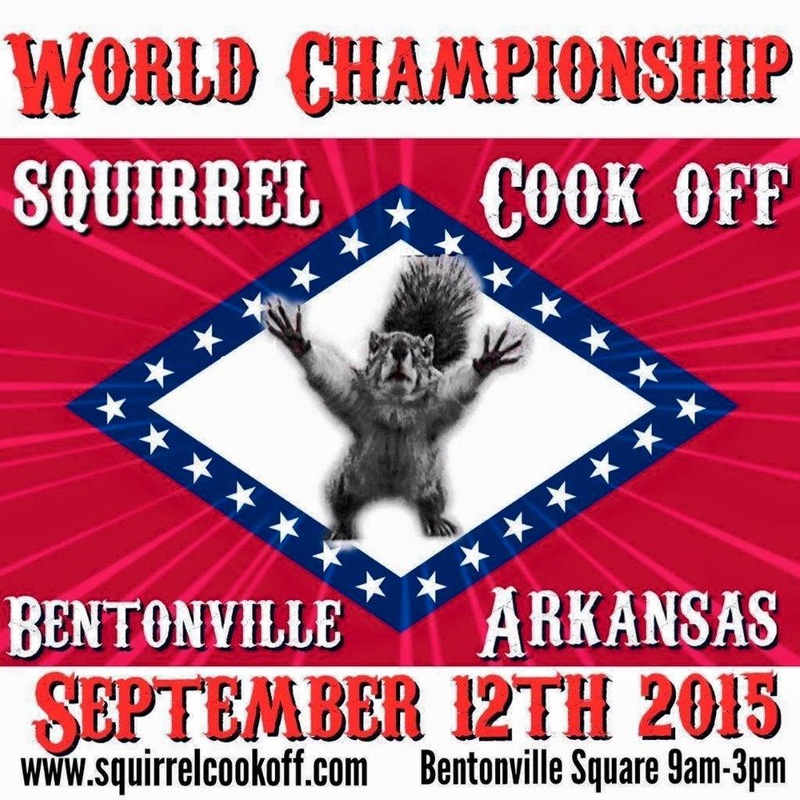 By then we will have missed the annual World Championship Squirrel Cook Off ), The Weiner Dog Races and Mule Jumping Competition. We were supposed to be back in Arkansas for about 4-6 weeks before heading West, but now we are down to less than 2 weeks. What do we have planned for 2 weeks? ONE MORE PROJECT…I SWEAR! After looking at the calendar today I realized that we have been in Elkhart Indiana for seven weeks now. I know that I keep saying, “we are wrapping up”, “looking forward to moving on”, “last project” etc., but it seems like one project keeps leading to another. Since we are in the mecca of RV superstar companies it only seems appropriate to get everything done here. After we finished up our major roof repairs and upgrades at MasterTech Rv here are the projects we have been working on. We got a PullRite Super Glide 5th wheel hitch direct from the factory here in Elkhart and took it over to the highly recommended Dan’s Service Center for installation. 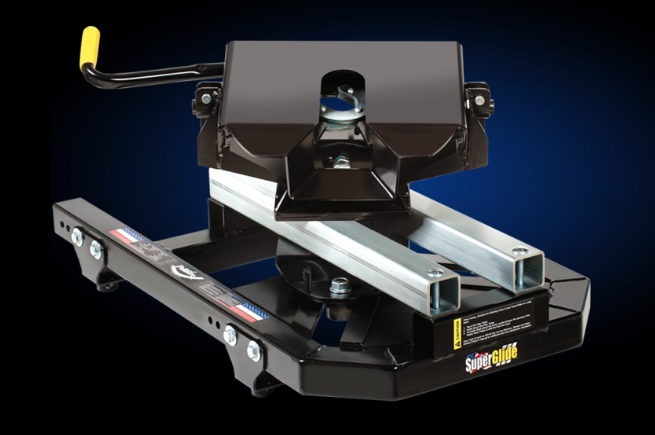 PullRite has the Super Glide hitch that is self-adjusting for short bed trucks so that you do not have to get out of the truck and unlatch something in order to make a sharp turn. What that “something” is, I don’t know…but it is VERY important! The PullRite hitch slides itself in order to accommodate sharp turns. Without the adjustment the front of the RV would crunch into the cab of the truck. This of course all falls into Jeff’s department(if you hadn’t figured that one out) …but I even found this hitch really cool. We are able to make such sharp turns that we accidentally pulled the emergency cord and locks up the brakes while turning around in a parking lot. Rookie mistake! While installing the hitch at Dan’s we had also researched the importance of air bags to support the truck suspension. So while there we got our airbags/compressor installed too. One press of a button and the truck end raises and lowers depending on the need. Once we were able to pull the RV out of Dan’s shop we headed over to MORryde to have a slide tray and new hitch installed on the RV itself. The hitch is designed to reduce chucking that happens while pulling. The chucking is a bit unnerving, especially when all I can think about is the bouncy fun house that is happening with all my stuff back in the RV. Word of the wise…”open overhead bins slowing as items may have shifted in flight”! MORryde is considered the best in the industry for hitching, independence suspensions and disc brakes. They also have 50 amp campsites (although very tight) and the nicest waiting room stocked with cool drinks, hot coffee and snacks…lots and lots of snacks. They even bought us lunch. We really wanted to install the independent suspension as well, but found out that our “special frame” on the RV would not support MORryde’s axles and IS system, so we would have to stick to Dexter. This led us to discover that the Dexter axles were completely underrated for the weight of the RV. And while we are in the process of discovery, the tires were underrated as well. They were truck tires that were more designed for the cool factor than supporting an RV. So guess what? We had to replace the axles, tires, rims and we added disc brakes. 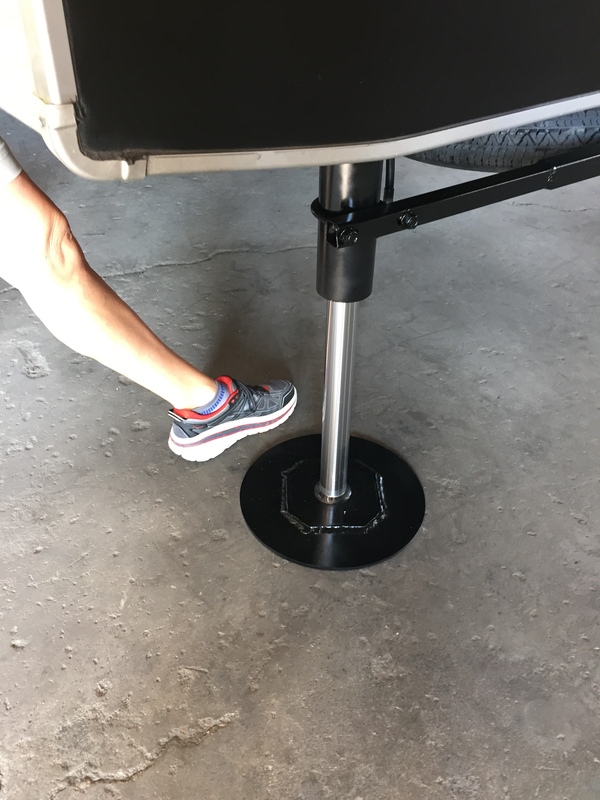 Now, when we installed the PullRite hitch in the 2015 GMC truck (which sits high to begin with) we had no idea how high this raised EVERYTHING! So when we hitched up the 5th wheel it was nose high…really high. MORryde found out that they could order our Dexter torsion axles at a steeper angle in order the raise the frame. MORryde even engineered a new plate raising us an overall 3 inches. They were able to also lower the RV hitch so that it dropped the front of the RV 3 inches as well. We still ride nose high, but it is a vast improvement. 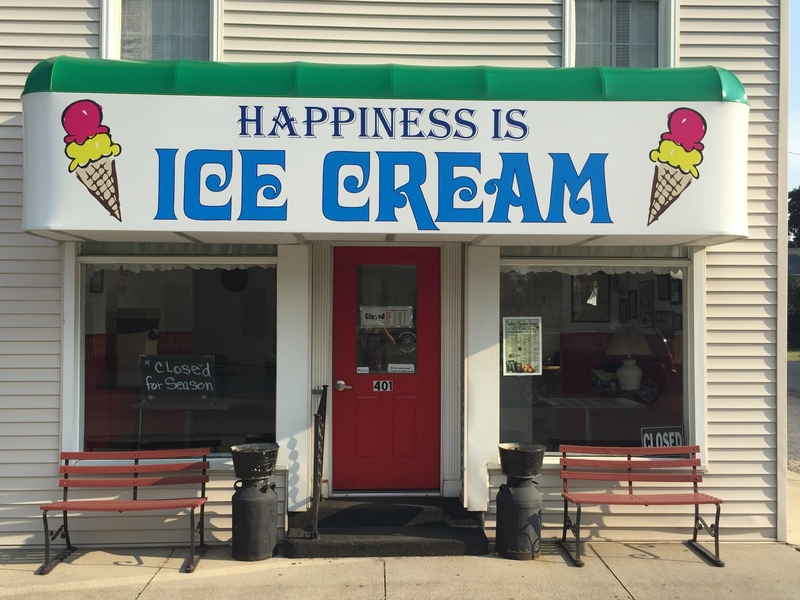 Good news for sure until we tried to drive the Domani out the shop door. 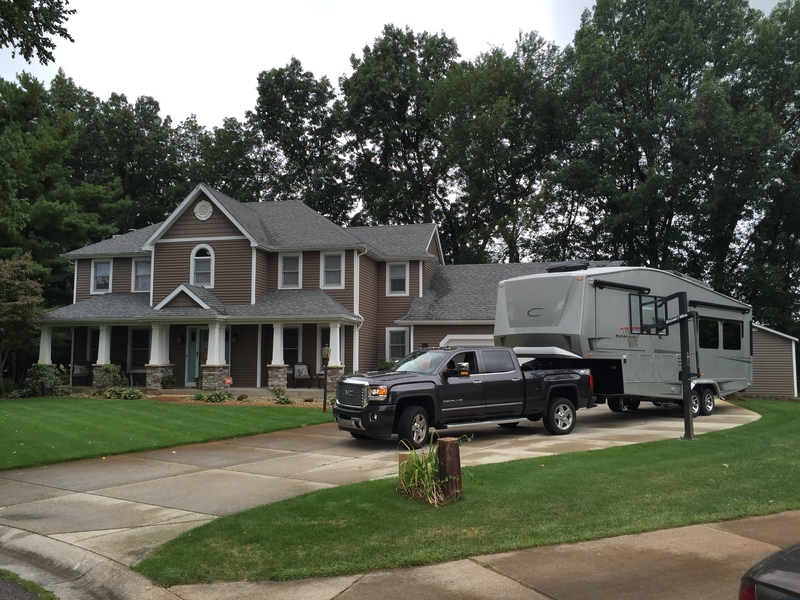 Bad news…the RV was raised so high, that we could not get it out of the garage. Holy Moly…anyone have a can opener? Letting air out of the tires. That was close! Feeling a bit panicked we were able to let just enough air out of the tires in order to get it through the garage door. We measured our height at 13’ 10” tall. YIKES…the maximum height of a tractor trailer is 14′, which means we will need to be very careful on back road underpasses. We hung out at MORryde for about 3 weeks total. We developed such a love for MORryde due to the people who work there. Rob and Gary went out of their way to communicate and collaborate with us about our project. One of the Engineers, Eric, even hand delivered some delicious homemade soup one evening! Wow, axles and soup! We had many laughs with the crew and other customers who were happily hanging out waiting on their projects. MORryde was first class service all the way and we can not recommend them enough! I’m sure by now you are falling asleep gripped with suspense to know what other projects we have been working on. So come back soon to read Part II!